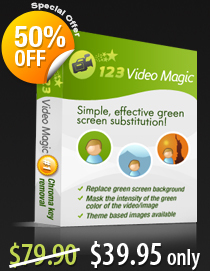 123 Image Magic is an amazing chroma key application that enables you to edit your green screen or blue screen images. Replace the background of any image with any sample or custom background image with 1- click. With 123 Image Magic, you can simply edit your image and upload it instantly to your Facebook and Picasa account. No need to depend on other image editing applications now! 123VideoMagic is an amazing video editing software that provides a simple way to remove green screen and substitute it with a digital background of your choice, in a professional manner. 123VideoMagic is a self-contained chroma-key removal program that does not require Photoshop or other photo editing application to produce beautiful green screen photos. Transform your photos & videos with Green Screen Software! Discover a new world of innovative and magical possibilities with 123VideoMagic Pro Video Editor.Capture, record, edit, and merge videos; superimpose still images, audios, and cool transitions. Make fingertips burst into flames, buildings invisible, change the background of the presenter to Hawaii or get yourself shot with celebrities, 123VideoMagic Pro does it all! Create perfect lighting conditions for both indoor & outdoor shoots! Premium Quality Lighting now at affordable rate! Our Complete Recording Studio Hardware provides you with stand, chroma key green and lights. background stand and green screen. Learn More... Our Green Screen Muslin Backdrops are available in 3 sizes 5x7 ft, 10x12 ft & 10x20 ft. Learn More... Chroma Key Green Full Body Suit is made of stretchable fabric, is close fitting and fits all sizes. Create exotic and exquisite photographs and videos with Background Image Packs effortlessly and swiftly. Our Image Packs unfurl pictures ranging from shimmering oceans, exotic landscapes, dazzling Las Vegas, intricate patterns, sensational magazine covers, majestic monuments and much more. These images can easily be used with 123 Video Magic Pro/123 Image Magic Chroma Key Software! Enjoy Replacing backgrounds in no time! Save $35 when you purchase 123VideoMagic Pro Video Editor & All 12 Image Library Packs for a special price of $99! 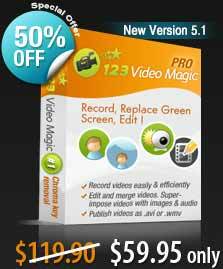 123VideoMagic Pro is one of the best green screen softwares I have come across! I can’t run my office without it! It has helped me to expand my business to many folds. falls on the subject which helps in amazing shoots. Having excellent photography experience!